You can add a custom BCC address if you want to use an address from another system, such as Salesforce, to log your emails. In the top right corner, click your name, then select My Settings. In the left sidebar, navigate to Email > My Email to Salesforce. Copy the value in the Your Email to Salesforce address field. In the left sidebar menu, navigate to Integrations > Email Integrations. 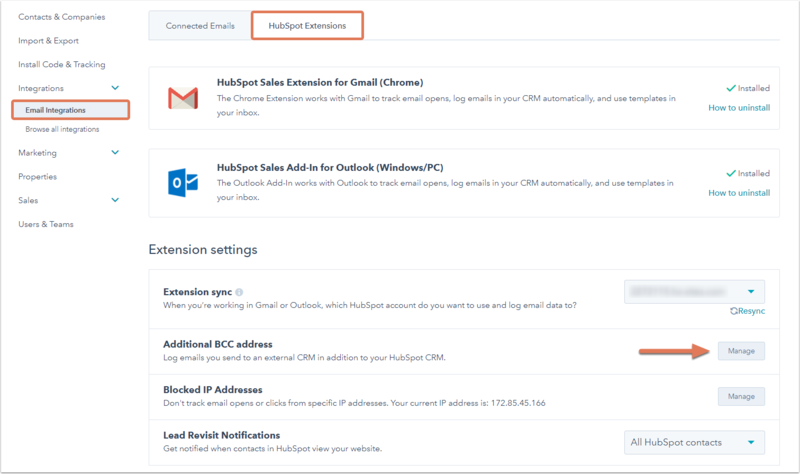 Click the HubSpot Extensions tab. In the Extension settings section, click Manage next to Additional BCC address. In the dialog box, paste the value from Salesforce and click Save. Moving forward, this custom address will be added when the Log in CRM feature is enabled in Gmail or Outlook, and your email will be logged in both systems.